Nestled between its beautiful sister-islands is where you’ll find Tenerife, the largest of Spain’s Canary Islands. The 890,000 residents of this oasis are surrounded by tropical forests, tranquil beaches and of course, the majestic Mount Pico del Teida. Tourists flock to the island to see attractions such as Teide National Park, Siam Park and the annual Tenerife Carnival. Pack your “sombrilla” and sun-screen, because cheap flights to Tenerife are now available for a limited period of time! Tenerife is home to international airport – Tenerife-North Airport (TFN), located just 20 minutes from the city centre. There is also a second international airport, Tenerife-South Airport (TFS). 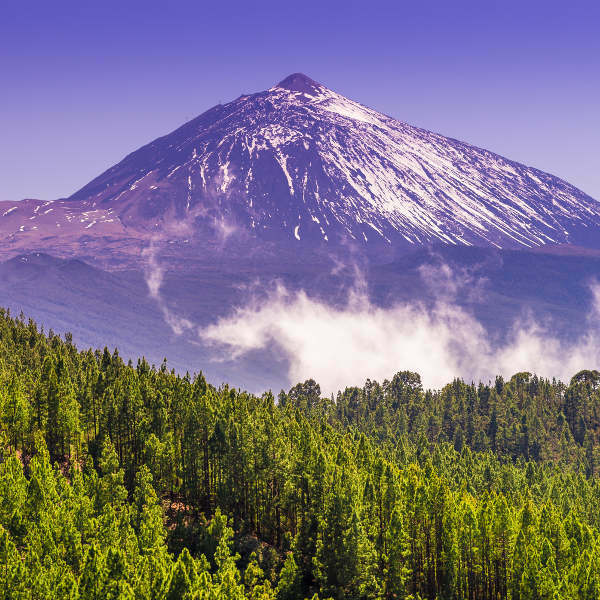 Spain’s tallest mountain peaks at 3,718m and offers spectacular scenery from all around Tenerife. Hike or take the cable car to enjoy the views. 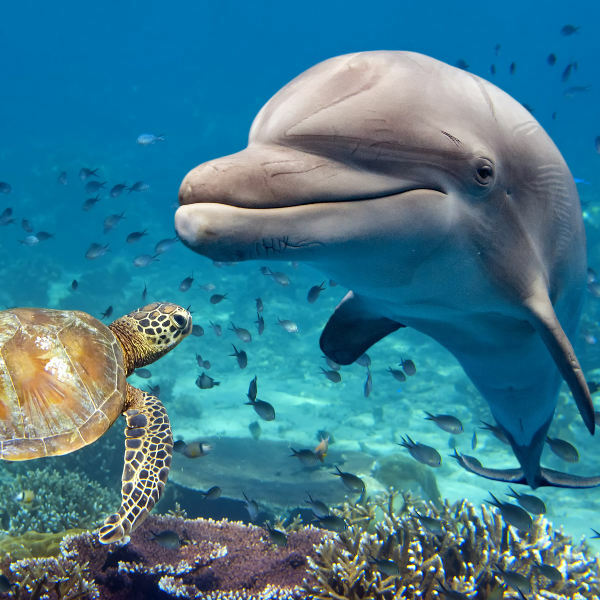 Spot dolphins, orcas and many other majestic sea animals that frequently visit the Tenerife coast, all year long. Take a boat cruise and make a day of it. Crystal clear waters are met by golden yellow sands as visitors enjoy the beaches of Tenerife. La Tejita is known to be the prettiest! With Tenerife experiencing fantastic weather all year, there really isn’t a bad time to visit this fantastic destination. Winter would, in most cases, be an off peak season but not here as this is the time when many European and North American tourists tend to flock to the island, looking for some sunshine. February (winter) is also the time for the annual carnival which brings in visitors from around the world. On the other hand, summer is also very busy with temperatures reaching beach-going highs of 25°C – 28°C. We would suggest that the best time to visit Tenerife is between March and May (spring) and also between September and November (autumn). This is when you would get better deals on affordable flights and accommodation, and will also not have to deal with overcrowded attractions. If you’ve heard that this Spanish island which attracts 10 million visitors a year is absolutely spectacular, then you most certainly have heard correctly! By obvious choice, the beaches are really something to write home about. Over centuries, the volcanic ash has tuned the sand into a fine, golden yellow sand that hugs your toes as you sink into it, and the crystal blue waters openly invite you in. Playa de Las Americas, La Arena and La Tejita are just a few of the blue flag stretches that are postcard-worthy scenes. Mount Pico del Teida, Spain’s tallest mountain, reigns over the island and is a great and rewarding challenge to avid hikers. The summit peaks at 3,718m, and if you’re not up for the hike you can take the cable car up to admire Mother Nature’s work on this stunner of an island. Compare several airlines, and book your cheap flights to Tenerife online at Travelstart. Tenerife is quite safe but as it is a very popular holiday destination, it is a good idea to be on the lookout for any petty crime. Keep your money and personal belongings out of sight and don’t buy electronics as they are sometimes fake. Also, though it may seem like a fun or romantic idea, do not sleep on the beaches in the evenings as you will be charged a hefty fine. Before your trip to Tenerife, make sure that all your routine vaccines are up to date. You will not need any additional vaccines for your trip to this Spanish island, but it is recommended to get shots for hepatitis A, hepatitis B and rabies.